Here is a timeline for Tudor Britain, from Henry VII’s victory at Bosworth in 1485, to the death of his granddaughter, Elizabeth I, in 1603. Henry Tudor becomes King Henry VII of England after his victory at the Battle of Bosworth. Lambert Simnel challenges for the throne, pretending to be the son of Edward IV. The rebels are defeated at the Battle of East Stoke and Simnel is given a job in the royal kitchens. In a wider context – Christopher Columbus arrives in the Bahamas instead of Japan. Commissioned by Henry VII, John Cabot (Giovanni Caboto, a Venetian) discovers Newfoundland. James IV of Scotland marries Margaret, daughter of Henry VII of England. Henry VIII marries Katherine of Aragon and becomes king of England. England at war with France and Scotland. Scotland invades England and is defeated at the Battle of Flodden. James IV of Scotland is among those killed. In a wider context, in Wittenberg, Martin Luther nailed his 95 Thesis to the door of All Saints’ Church, or the Schlosskirche, questioning excesses and corruption in the Roman Catholic Church. In a wider context – Portuguese explorer Ferdinand Magellan leads a Spanish sponsored expedition that resulted in the first circumnavigation of the globe. England at war with France. In Worms, Germany, John Tyndale publishes a translation of the New Testament in English. England at war with Spain. Henry VIII seizes Hampton Court from Cardinal Wolsey. Archbishop Thomas Cranmer annuls Henry VIII's marriage with Katherine of Aragon and Henry marries Anne Boleyn. The Act of Supremacy - Henry becomes Head of the Church of England - the official start of the English Reformation. The dissolution of monasteries in England begins. Sir Thomas More is executed. Anne Boleyn is executed. Henry VIII marries Jane Seymour. The Pilgrimage of Grace – a rebellion, particularly in Yorkshire, against Henry VIII’s religious reforms. The first ‘Laws in Wales Act’, often incorrectly referred to as the ‘Act of Union’ between England and Wales, abolished the Marcher Lords, established Welsh administrative areas and MPs and aimed to harmonise Welsh administration and law with English. Jane Seymour dies having given birth to a son, the future King Edward VI. Publication of Henry VIII’s Great Bible in English. Henry VIII marries and divorces Anne of Cleves. Thomas Cromwell, principal architect of the Reformation, is executed. Henry marries Kathryn Howard, his 5th wife. Henry VIII makes himself King of Ireland. The English defeat an invading Scottish army at Solway Moss. The rough wooing - Henry's violent and failed attempt to force an alliance with Scotland by marrying his son Edward to the future Mary, Queen of Scots. The second ‘Laws in Wales Act’ tightened provisions of the Act of 1536. England was at war with France. Henry VIII married for the last time - Katherine Parr survived him. Henry VIII dies. Edward VI becomes King of England. The new king is determined to reform the English church and make it more Protestant. The First Act of Uniformity establishes the Book of Common Prayer, a standard form of worship across England and Wales. The Kett Rebellion in Norfolk – the largest of several rebellions at the time, mostly in protest against landlords’ enclosures of common land. The rebels captured Norwich, England’s second city, but were eventually defeated. Edward VI dies. Lady Jane Grey was uncrowned Queen for 9 days before Mary, the daughter of Henry VIII and Katherine of Aragon, comes to the throne. Mary is determined to return England to Roman Catholicism. Protestants begin to be persecuted. Mary marries the King of Spain, Philip II. The Wyatt Rebellion – arising from fear that England would be ruled by Spain. Lady Jane Grey is executed as a precaution. Prominent Protestant churchmen Hugh Latimer and Nicholas Ridley burned at the stake. Former Archbishop Cranmer burned at the stake. Calais is taken by the French; England no longer has any territory in France. Mary dies. Elizabeth, daughter of Henry VIII and Anne Boleyn, becomes Queen Elizabeth I of England. Enthusiastic Protestant John Knox returns to Scotland from exile. In England, the Book of Common Prayer once again becomes the only legal form of worship; the Catholic mass is henceforth illegal. Captain John Hawkins sells African slaves in the Caribbean. Murder of Rizzio, Mary, Queen of Scots’ secretary, in the Palace of Holyrood, Edinburgh. Mary, Queen of Scots is imprisoned in Loch Leven Castle. Mary, Queen of Scots, defeated at the Battle of Langside, escapes to England. The Pope declares Queen Elizabeth a heretic and excommunicates her. Francis Drake raids the Spanish Main. Sir Martin Frobisher searches for the North West Passage. Francis Drake returns to England having circumnavigated the world. Colonisation of Virginia. Queen Elizabeth grants Walter Raleigh a charter authorising exploration and colonisation of remote, heathen and barbarous lands. Walter Raleigh introduces tobacco, maize and potatoes to Britain (it is possible that tobacco, at least, was known in this country before then). Execution of Mary, Queen of Scots at Fotheringhay Castle as a consequence of being implicated in the Babington Plot, one of several plans to assassinate Elizabeth and replace her with Mary. 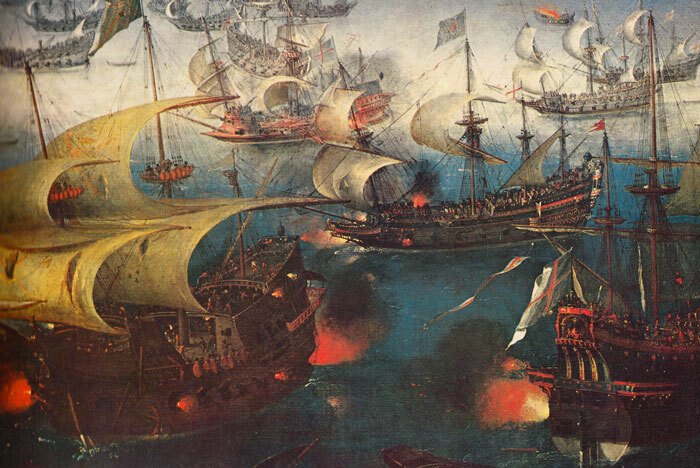 The Spanish Armada – an attempted invasion of England is thwarted by a combination of better leadership and bad weather. First performance of Shakespeare's plays - possibly Henry VI, Parts I, 2 and 3. British East India Company receives its charter. Elizabeth I dies. The English throne is offered to James VI of Scotland, who becomes James I of England and the first King of Great Britain.